Feel the Warmth of the Golden Sun on your Tan Face as you enjoy the Breathtaking Views from your Private Balcony of this Romantic Beach Penthouse. 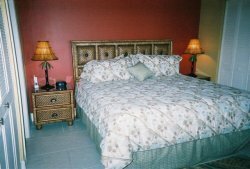 Decorated with New, Tropical, Tommy Bahama-Style Furniture and Colors. 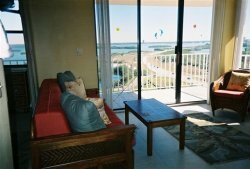 You might have a hard time leaving as you Savor the Beautiful Views of the Sunrise over Estero Bay or Watch the Dolphins Play while you Enjoy Another Romantic Sunset over the Gulf of Mexico from the Privacy of your Own Balcony. 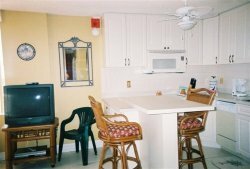 Now if you decide to stay in, then you can cook a great meal in the Newly-Remodeled, Eat-In Kitchen which is Stocked with All the Utensils you will ever need. But if you decide to head downstairs... then a Sparkling, White-Sugar, Sand Beach with Plenty of Lounge Chairs Overlooking the Warm Waters of the Gulf of Mexico await just Outside Your Door. Relax with your favorite book or "Umbrella" Drink by your side as the Pelicans Glide Over the Water. Or jump on a Waverunner or into a Pontoon Boat Conveniently Located right on your Own Private Beach. If you are in the mood for a little "Exercise," then take a Long, Lazy Stroll down the Endless, Romantic Beach past Lover's Key State Park ansd see why the Travel Channel rated it as One of the Best Beaches in Florida. If you want to avoid getting sand between your toes, then Enjoy the day instead at the Relaxing Heated Pool and Spa while Barbecuing on our Wonderful "Dolphin" Deck with Breathtaking Views of the Sunset over the Gulf of Mexico. Now, if you are in the mood for some Nightlife, then jump into one of the 25-Cent Trolleys (No Need for a rent-a-car) which Stop in the Building's Parking Lot and head into town to experience one of the Many Beach-Side Restaurants and Nightclubs with Spectacular Views. 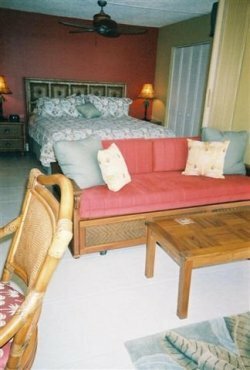 Everything you would ever want and more is available for your Enjoyment during your "Escape to Paradise" in this Romantic, Beach Penthouse. Red Sox and Twins Fans: This is the Perfect Place to stay for Spring Training with Your Teams Playing Just Minutes Away. It's a Grand Slam!